Hi Guys! Welcome to my blog. Today I am going to share top five uses of Vitamin E capsules according to me. Do not close the tab after reading this and make sure to follow my blog. It’ll mean a lot to me and also check out my other posts. I am sure some or the other would be helpful to you. I would love to have your suggestions, advice, appreciation and criticism too. Vitamin E capsules have oil in them which have innumerable benefits for our skin, hair, nails and overall health. It is our beauty magic wand which rejuvenates our beauty. 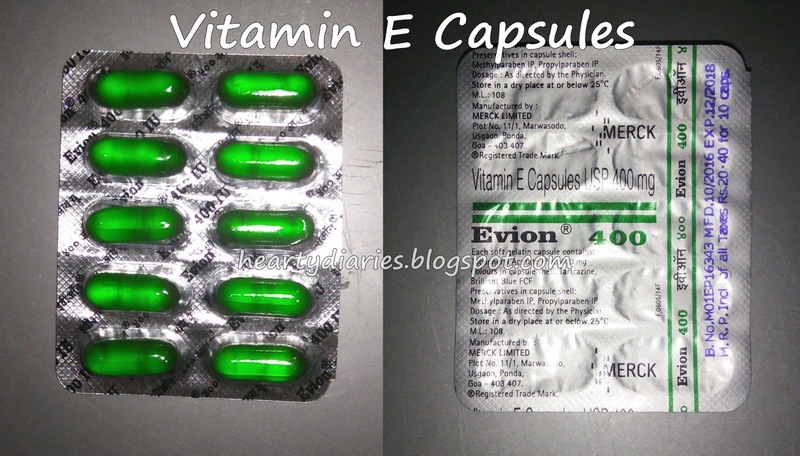 Vitamin E oil or capsules (under the official name “Evion 400 Mg”) are easily available in all drug stores and they’re a must have for me. If you’re using capsules, you can either cut them, extract the oil and store it in a container or simply poke with with a needle to get the oil whenever required. These capsules are really cheap and you can get 10 capsules for Rs. 20. 1. Prevents and treats hair thinning and bald patches: Vitamin E is an amazing ingredient for our hair. It helps nourishing our scalp, fight infections and hair problems, repair hair follices and treat hair thinning. I have personally experienced this advantage of Vitamin E oil, thus keeping this one at first. I had got really thin hair at my hair line 4 months ago. I used this oil regularly at my scalp by massaging it in circular motions daily at night and I was really glad to have got a magic like result. I could see getting my hair back to normal within two weeks and my hair line completely got normal within one month of regular use. This oil also prevents and treats bald patches. This oil is really thick in consistency, so you can also mix it either with coconut oil or any hair oil that you prefer and then apply it. 2. Helps promote nail growth: You could also apply this oil to your nails to promote nail growth, repair broken or infected nails and treat pitting cuticles. Apply this oil to your nails and cuticles daily and rub your nails against one another. This will lead to longer, stronger and shinier nails. This rubbing of nails is also known as Balayam Yoga and helps improve hair growth, prevents hair graying and stops hairfall by stimulating scalp activities. 3. Treats chapped lips: Why buy a lipbalm when you can easily treat your lip problems in less than Rs. 10 (technically Rs. 4)? Take one to two capsules and extract the oil, mix it either with honey, castor oil or coconut oil and apply it on to your lips at night to treat chapped lips. This oil can also be applied directly wthout adding any other oil but it is quite sticky which some people don’t prefer. Apply this oil daily also helps in treating pigmented lips. 4. Night Cream: No shame, most of us have dark circles but not every one can buy separate day creams, night creams, under eye creams etc. So, Vitamin E oil is a saviour for you in this problem also. Take two capsules, extract the oil and add half teaspoon aloe vera gel in it. Mix both the ingredients well until you achieve a cream like consistency and apply to under eyes daily at night. You will see a notable difference in your dark circles. Again this oil can also be applied to the entire face directly but to thin up the consistency a little bit and to prevent oiled pillows, adding aloe vera gel is a better option. 5. Treat hyper pigmentation: You can also use this oil to your neck, elbows, knees, acne scars and hyper pigmented lips to reduce their pigmentation and discolouration making them softer and more beautiful. It also prevents acne and pimple in addition to lightening their scars. Once again, I would like to inform you all that all these uses have been personally tried by me and I love them. I would never give a suggestion to any one that may be harmful but if you are under some medical conditions, make sure to consult your doctor once. Thank you for reading and visiting my blog. Please follow it and also subscribe to Sidra’s channel. I am leaving all her social media details below. Do not forget to like my Facebook page and also follow me on Instagram and Roposo. Thank you. I'm glad you liked it. ?